Looking for a place to improve your swing and practice the great game of golf in Chicago and the suburbs? You’ve come to the right place. ChicagoGolfReport.com is proud to present the most comprehensive list ever compiled of public golf driving ranges in Chicago. Here are 78 of the top golf driving ranges and golf practice facilities in the Chicagoland area. Arrowhead’s driving range features 30 hitting bays on mats – no grass. They also offer a putting green and a separate chipping green with three bunkers. The driving range closes at dusk in the spring and fall, and is open until 9:00pm Memorial Day thru Labor Day, with the exception of Mondays. On Monday, they completely close the driving range and chipping green two hours before sunset. 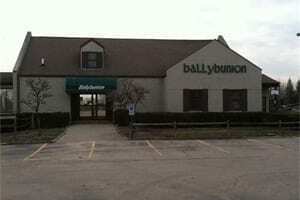 Ballybunion Golf in Long Grove features a 340-yard driving range, a 18 hole mini-golf course and a 4000 square foot putting range. The facility offers 68 practice tees including grass tees and 20 heated stalls so you can practice your game all year round. Bring your whole family to play the “Links of Ballybunion” an 18 hole mini-golf course. Bittersweet offers a driving range and chipping/putting practice area. The last bucket of balls is sold up to 30 minutes before closing times, weather permitting. The Bolingbrook Golf Club Driving Range & Golf Academy offers a 14,500 square foot putting green, bent grass tees with 65 hitting stations and 12 target greens. Also available is a unique short game area with a myriad of greens, bunkers, slopes and two practice holes. Lights provide the opportunity to practice after dark from May through end of September. Boone Creek Golf Course offers a 20 acre driving range with 10-20 hitting bays depending on seasonal demand and all grass tees. Pinnacle full flight range balls and four target greens provide a quality practice experience. The facility also provides accurate yardages to each flag measured daily to assist in club selection. In addition to the driving range, Boone Creek features a half acre putting green and a chipping green that allows for pitch shots within 30 yards and from realistic fairway lies. The chipping green also has a greenside bunker. The driving range at Broken Arrow Golf Club is located just outside of the clubhouse near the first tee for two of the three nine holes courses. The range features mats and grass tees, when available. Cantigny Golf Academy offers heated indoor and outdoor hitting bays on both grass and mats. They also offer video swing analysis studios, golf club fitting, golf-specific training and fitness, as well as mental skills training. The driving range at Cantigny opens one hour prior to the first tee time on the Main Course and the last bucket will be sold one half hour before closing. A 20-station driving range is available At Chalet Hills Golf Club along with chipping and putting areas, which are located near the first tee. The Cog Hill Learning Center is open 364 days of the year and offers a combination of natural grass hitting areas, covered, heated hitting stations with mats, target greens, Callaway range balls, and a well groomed short game area. Countryside Golf Club offers a driving range and 15,000 square foot short game practice area. The driving range at Coyote Run Golf Course in south suburban Flossmoor is lighted and offers grass tees and mats. The Crystal Woods driving range features grass tees, target greens and is large enough to allow you to practice with every club in your bag. Range tokens cost $4.00 and provide 33-35 balls. The 1/4 acre putting green gives you the opportunity to practice downhill, uphill, and sidehill putts with both left-to-right, and right-to-left breaks. There’s also a chipping green with bunkers for practicing sand shots as well as short, medium and long chips and pitches. The driving range at Deerpath Golf Course features grass tees with recently renovated target greens to simulate on-course shot making. The driving range is open every day from dawn to dusk, with the exception of Wednesday evening when it closes early for maintenance. All weather mats are used when unfavorable conditions would otherwise close the range. A chipping green area with sand trap is also available along with a practice putting green, which is located just outside the clubhouse. 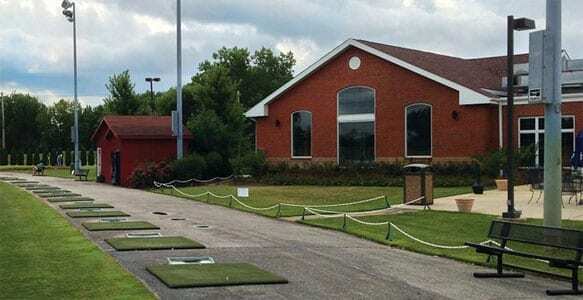 A nine hole golf course until the late 1940’s, Diversey Driving Range offers a synthetic turf range, two synthetic putting greens, eighteen holes of miniature golf, and multiple covered, heated hitting mat areas along with target greens. The upper hitting deck offers exceptional views of Lake Michigan, Diversey Harbor, Lincoln Park Zoo, and downtown Chicago. In addition to a large grass and mat driving range, Deerfield Golf Club & Learning Center offers a “Lunch Bucket Special”, which for $14 includes a medium bucket of balls, hot dog or bratwurst and a soft drink. Separate pitching and chipping greens are also available along with a chipping and putting green, sand bunkers and two large putting greens. The driving range at Flagg Creek Golf Course is located in the middle of the property and offers mat hitting stations on the weekdays and grass hitting on the weekends. A large practice putting green is available adjacent to the first tee and short game practice area that includes a large sand bunker is located to the south of the 9th tee box. The driving range and practice putting green are lighted and usually open until 9PM during the summer. Fore Seasons Golf Learning Center offers 25 outdoor premium hitting mats that provide true ball flight and spin control and can be set up with varying rubber tee heights for both right and left-handed golfers. They also offer 15 grass practice tees that are hand cut, fertilized, watered, and weeded. Group and private lessons along with club repair and club fitting are also available. The lighted driving range at Foss Park Golf Course offers 30 grass tee hitting bays along with a practice putting green. Fountain Hills offers two practice areas with a putting green and chipping green. There is a 30 station lighted driving range adjacent to the full service clubhouse restaurant “The Back 9” with an outdoor patio area. The practice facility at Foxford Hills is lighted and includes a 30-stall, grass-tee driving range with four target greens tightly guarded by highly contoured bunkers. The learning center at Fresh Meadow Golf Club offers both grass and mat hitting stations and covered, heated hitting bays that are lighted for use at night. In addition, a large short game practice area including chipping and putting greens are available. George W. Dunne National Golf Course offers a driving range with synthetic mats that is located just north of the parking lot. A driving range with grass tees is available at The Glen Club and is adjacent to the parking lot on the north side of the facility. The driving range at Glencoe Golf Club features grass tees (weather permitting) and a variety of targets to aid in your practice. Bunkers are also available on the tee line to practice your long iron shots. The range is limited to iron use only. Consistently ranked one of the Top 50 Stand Alone Ranges in America, Golf Center Des Plaines features a three-tiered, year-round driving range with 80 lighted & heated hitting stations, and a fully automated tee-up system. 1½ acres of practice area are also available with two large practice greens, multiple sand bunkers, and enough open space to practice chipping and pitching from up to 60 yards away. The Grayslake Golf Practice Center is an eight acre green grass outdoor driving range with 9 target greens. It is full-flighted to 270 yards plus further undeveloped land producing ‘unlimited’ driving distance. There are 20 hitting stations off of mats and 25 hitting stations that hit off of grass. This facility includes a chipping green and a practice (sand) bunker. Presently there are no lights for night-time hours. The Grayslake Golf Practice Center is open during the months of April through October, weather permitting. Open at 8AM every day Green Valley Golf Range in Hanover Park offers 80 lighted hitting stations and an expansive grass hitting area, all with targeted greens. Open for 45+ years, the facility’s slogan is “We have better balls”, since they replace their driving range balls every year. Green Valley also has 20 heated tee stations as well as a putting green, sand bunker and chipping area. The practice facility at Harborside International Golf Center offers a complete 57-acre practice arena featuring expansive bent grass tees, bent grass fairways to accurately gauge distance on tee shots and four target greens to groove precise iron approaches. Separate areas for chipping, pitching and sand play are also available along with a large putting clock for putting drills. Heritage Bluffs offers an all-grass driving range along with a large putting green and a separate chipping green and bunker. Hilldale Golf Club offers all-grass hitting stations, a short game area with bunkers as well as chipping and putting greens. The practice facility at Indian Lakes includes two large putting greens, sand bunkers, and a driving range with grass hitting stations. Lake Bluff Golf Club provides an expansive practice facility with grass tee driving range, practice putting green, and bunker, short-game area. With two tiers, the Libertyville Golf Learning Center features matted tees, grass tees and weather protected automated tee stations. Recognized as a Top 50 Stand-Alone Range by the Golf Range Association of America, Links & Tees Golf Facility offers an outdoor practice range with more than 50 hitting stations featuring both natural or synthetic grass mats and target greens. There is also a short-game area with a 10,000 square-foot putting green, 5,000 square-foot chipping green and practice sand bunker. The Links at Carillon driving range offers both grass tees and mats as well as a separate chipping and putting green. The Makray Memorial Golf Club driving range features grass tees with numerous target greens and bunkers. A large practice putting green is also available for short game improvement. A full-size grass practice facility is part of Marquette Park Golf Course which includes a driving range stretching that is nearly 300 yards deep. For short game practice, two chipping and short game greens as well as a regulation size putting green are available. The Meadows Golf Club is located in the south suburb of Blue Island and their driving range features grass hitting stations – no mats. The facility is lighted and is typically open until 10PM during the summer. The driving range at Mid-Iron Golf Club in Lemont offers 50 grass tees and is located just north of the clubhouse. The driving range at Midland Golf Resort boasts a 100 x 300 foot bent grass tee which features target greens and bunkered greens as well as yardage makers to help with distance judgement. A practice green is situated conveniently adjacent to the clubhouse enabling golfers to practice their putting, chipping and bunker shots while waiting for their turn on the first tee. Mistwood Golf Club Performance Center is rated “Top 50 Ranges in the Country” by Golf Range Magazine. The facility features two teaching bays, eleven heated, covered hitting bays, a 40 yard long hitting mat and grass tees. Also available is a short game area with bunker and a members grass and mat hitting area to go along with one of the biggest practice greens in Chicago. The Performance center also has a club repair room, and custom club fitting where they will match any manufactures head with any standard or custom shaft, using state of the art technology including TrackMan. To round off your experience, Mistwood offers a beautiful bar, Turf Room, and restaurant. McQ’s Sports Dome offers 50 hitting stalls along with a chipping green and two practice putting greens. After golf, grab a bite to eat in McQ’s Sports Bar. Mt Prospect Golf Club features a driving range, two practice putting greens, two chipping greens with a short game area and sand bunkers. 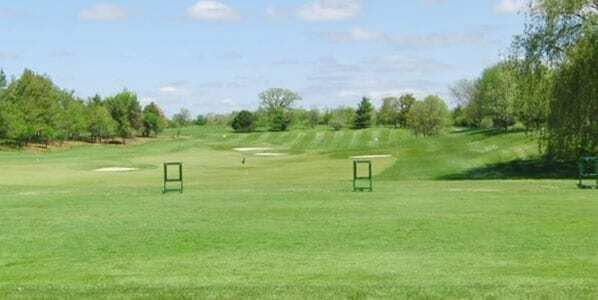 Naperbrook Golf Course offers a ten-acre driving range with both grass tees and mats, as well as 10,000 and 3,000 square foot practice putting greens. Located just past the first green and accessible from the course via golf cart, Odyssey’s driving range is also accessible to the public from Oak Park Avenue. 24 lighted and heated hitting bays (all year) and 24 grass tees (May – October, weather permitting) are available along with 5 target greens. The range also offers two short game environments, chipping and putting greens, with sand bunkers. The driving range at Old Oak Country Club was built on the highest point of the property, providing golfers a fifty foot elevation drop from the tee line to the back of the range. The driving range is surrounded by large trees on three sides and complimented by four target greens with bunkers. Grass tees are available weather permitting. Artificial tees are used when grass tees are unavailable. A short game practice area also offers a practice green with 3 large bunkers and 30 yards of fairway to practice chipping, pitching and sand shots. Adjacent to the short game area is a large putting green. The Oakton Driving Range offers hitting stations with mats as well as five different targets at various yardages. A putting green and sand bunker are also available for short game practice. The driving range at Pheasant Run Resort is located at the far East of the property and features both grass and mat hitting stations. The range offers numerous targets at various distances for more focused practice. Pinecrest Golf Club features an all-grass driving range (during early spring and late fall, mats are used on the practice range) with three target greens, practice sand/chipping green and practice putting green. Consistently rated as one of the top practice facilities in northern Illinois, Pine Meadow offers a lower and upper range. On the lower level there are two flat surfaced putting greens, a chipping green with a green side bunker to practice your sand shots and short chip shots as well as 55 grass tee stations. The upper range includes an additional 45 grass tee stations and 30 mat stations as well as a chipping green with a green side bunker. The upper range is also lighted for use at night. A 50 station lighted driving range is available at The Bridges of Poplar Creek with hitting off grass and synthetic surfaces to four target greens. A 9,100 square foot putting green and 3,500 square foot bentgrass chipping area are also available at the Golf Learning Center. The driving range and practice area at Prairie Bluff Golf Club are located within a short distance of the first tee. 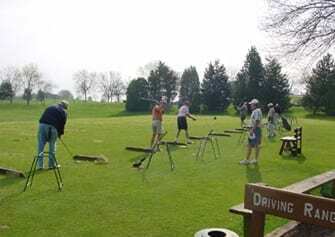 The driving range offers mats as well as a large grass area. The practice area includes a full chipping green with a side bunker and plenty of room to practice just about any aspect of the short game. Prairie Landing offers one of the top golf practice facilities in the Chicago area including a driving range, practice chipping area, practice putting green and two regulation Par-4 practice holes. The two available practice holes are 300-350 yard Par-4’s with a third practice hole available as a Par-3 that plays to the same green as the second practice hole. These practice holes are set in a secluded area adjacent to the clubhouse and are a terrific way to focus on practice. The driving range at Prairie Landing offers both grass tees and mats. The driving range also features a convenient range ball machine dispensing system that accepts credit cards, pin codes and member eKeys. Ravisloe offers a driving range with mats and grass tees directly adjacent to the parking lot. A short game practice area along with a large practice putting green are also available. The driving range at Renwood Golf Course is open daily 6:30 AM to sunset with the exception of opening at 9 AM on Thursday mornings due to mowing. Established in 1976, Reidy’s Tee Time is billed as “The Country Club of Golf Driving Ranges”. The driving range offers a large selection of hitting areas and targets – both mats and turf. The driving range at Ruffled Feathers Golf Club is located directly north of the parking lot and features grass tees as well as mats. A practice putting green is also available and is located adjacent to the first tee. Sanctuary Golf Club offers a driving range directly south of the parking lot with grass and mat stations. A practice short game area with a sand bunker is located at the east end of the practice range. Rated one of the top 50 golf driving ranges in America, Skokie Sports Park features a year-round, two-tier, 40 station range with an automatic tee-up system. Instead of buying a bucket of balls, golfers purchase a debit card. The driving range at Sportsman’s Country Club includes 30 mat hitting stations with a landing area of 275 yards. The facility is lighted for night use and also offers a practice bunker for long fairway shots and close, greenside bunker shots. The St. Andrews Practice Center covers 32 acres featuring over 80 lighted grass tees, five target greens with target fairways, two chipping greens a putting green and top quality range balls. The facility also offers a 10 bay heated & sheltered hitting structure. Stonewall Orchard features an impressive practice facility that includes a 43,000 square foot practice tee with grass hitting stations and target greens. You can also practice your short game including putting, chipping, pitching. Stony Creek in Oak Lawn provides a grass and mat driving range, chipping/putting area, practice putting green, computer-aided video, and sheltered stalls for year-round availability. The driving range at Sugar Creek Golf Course features 25 practice stations with target greens and flags marked with various yardages. The driving range is lighted and is open year-round, weather permitting. Sugar Grove Golf Center offers a lighted mat driving range with distances clearly marked and there are several targets at which you can aim. Thunderhawk Golf Club offers a 10-acre learning center that features a 40-station driving range including specialized short game areas, chipping and putting greens, and practice bunkers. Turf and synthetic surfaces hitting surfaces are available. TopGolf offers a three-tiered, heated driving range. TopGolf tracks each ball hit and provides instant feedback on the distance and location of each shot. Their golf balls contain a microchip with your information imbedded into it. You’ll fire shots out towards any one of the 11 recessed target greens, ranging from 25 to 250 yards or more in distance. You then receive immediate personalized feedback on the monitor screen that will visually show you exactly how far your ball was hit and how close it came to the flagstick. T-Time Golf Driving Range in southwest suburban Homer Glen offers a lighted range features 30 matted tees, 15 grass tees (weather permitting), putting green and chipping green with sand bunker. Six stalls are covered and ten matted stalls are equipped with Vijay Singh’s “The Golf Mat,” a spring steel mat simulating grass hitting action. T-Time uses Wilson and Srixon range balls. The Wilson range balls are 90 compression, while the Srixon range balls are 80 compression allowing different feel and ball flight. Village Greens of Woodridge offers an all grass practice range as well as a warm-up small bucket – with any paid greens fee. Fill out the form on their website and Village Greens will send a coupon for a complimentary bucket of balls. Village Links of Glen Ellyn practice facilities are open to the public, with 40 grass hitting stations, four putting greens, secluded chipping, putting and bunker area. They also have 36 artificial turf tees during extremely wet conditions, and during the winter months. A short game practice area is free of charge; players use their own practice balls. These greens, chipping areas and bunker are maintained to the same quality as the golf course. The driving range is open daily from dawn until dusk. The driving range at Water’s Edge Golf Club features grass hitting stations as well as mats for use during wet conditions. A short game practice area is also available on the west end of the driving range and includes a sand bunker. The driving range at Whisper Creek Golf Course is open daily from sunrise to sunset and includes three large grass tee sections that are rotated throughout the summer. 16 additional range mat stations are used during wet conditions and during late fall and early spring. White Mountain Golf Park offers 35 artificial surface hitting stations and over 13,000 square feet of grass hitting space. The facility is lighted and also includes heated and covered stalls for year-round practice. The White Pines Golf Club driving range includes grass and mat hitting stations as well as and two practice putting greens. The Willow Hill Golf Course driving range features 40 natural grass tees, a chipping green and two putting greens. The driving range is located west of the clubhouse and faces towards the west. Selected as one of the Top 100 Golf Ranges in America, the Zigfield Troy Golf driving range includes 60 bluegrass hitting stations – one of the largest in Illinois, as well as mats for use during wet conditions. Six heated/sheltered hitting stations for year-round use. A practice chipping and bunker area as well as putting green are also available. The practice range features target greens guarded by simulated sand bunkers and several colored flags as targets. The flags are always adjusted at 25-yard increments from the tee line (75 yards to 200). The practice facilities are open every day of the year – except Thanksgiving, Christmas, and New Year’s Day. November – March hours are 9:00 am – 5:00 pm. Early and late season hours are 8:00 am until sunset. Memorial Day through Labor Day we are open 7:00 am until sunset.